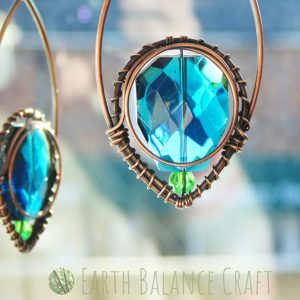 A rustic and weathered leafy drop hanging mobile with mottled green/blue verdigris solid copper metal leaves. This decorative piece of wall or window art is inspired by spring time woodland, when fresh and vibrant colours adorn the forest, such a delight after the stark bareness of winter. 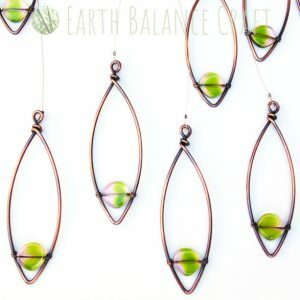 Each droplet has a swivel barrel at the top which means they can rotate 360 degrees with free movement. 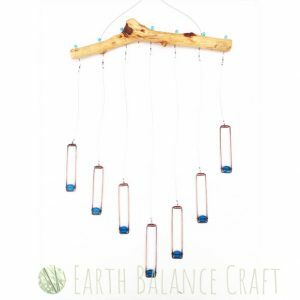 This pretty woodland wall hanging features a minimal wire work tree design dotted with green and clear gemstone and Czech glass beads. The trees are rooted onto a piece of Isle of Wight driftwood.